Phillippa Namutebi Kabali-Kagwa and Peter Kagayi are both formidable performers. 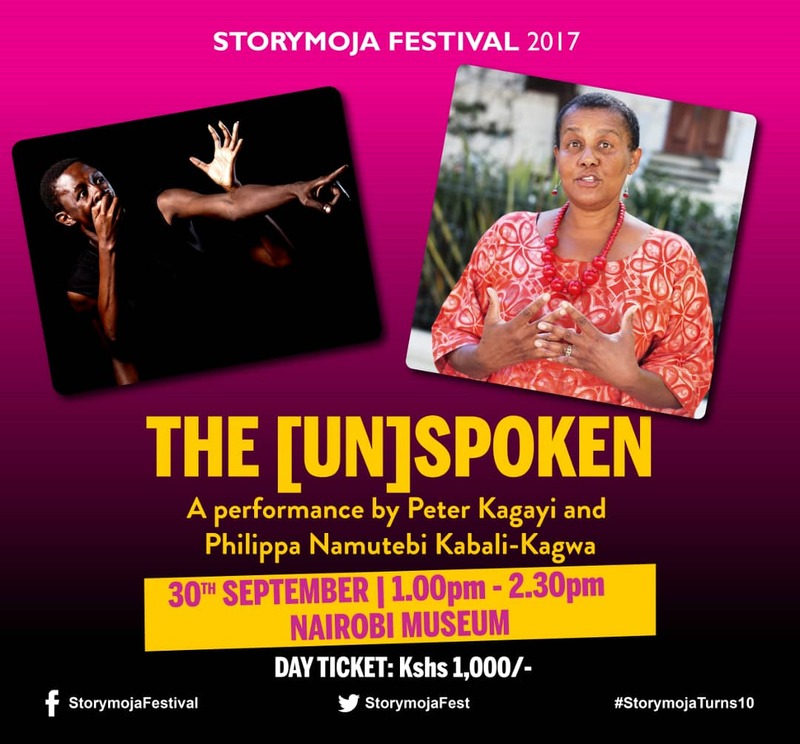 They enthral audiences with their words; Philippa with her natural flair for storytelling turns even the most mundane conversation captivating and Kagayi with his flair for drama will have you spell-bound right from the beginning. I am all the way ready to be mindblown! I have the pleasure of sitting in on one of their rehearsals and I’m stoked. The session takes place in Nairobi. Philippa, arrives at about 9a.m. just as we are winding up with breakfast. In true African fashion, she sits down for breakfast number two of roasted binyebwa and tea. Not wasting time on niceties, they dive right in . Fear seems to be a term that has continuously come up in conversation between the two authors. 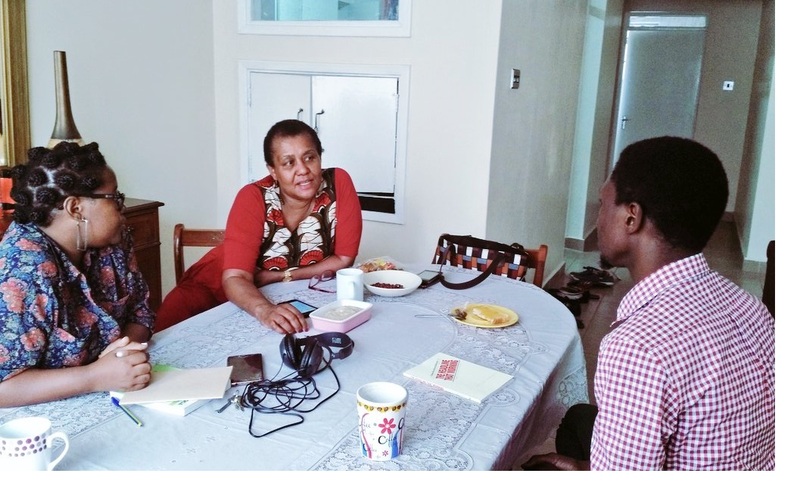 Fear in the 70’s when Phillippa grew up, fear now in Kagayi’s generation and the role it plays in some of the problems East Africa is facing today. Philippa talks about the palpable presence of fear. She reads a poem she had scribbled down in light of the discussion over the last few days. Not to give too much away as it will be performed at the show, but it revolves around the idea of braveness even in silence, but reaching a point and realising that the silence needs to break, and that you too need to get up and find your place in the fight. Kagayi, blown away, talks about how the serenity of Phillipa’s poetry works side by side with her pain. He describes himself as angry and bitter, and rightfully so given all that has been going on. But he sees her sense of peace and wonders how she got there. And she responds saying, that it is her way. She cannot stay with rage. Rage drains her. But that is her way. His way is his. And it is important for him to own his way. To learn to process the rage and ensure that it becomes it is defined. Conscious. As much as Philippa is not one to get enraged, she believes there is a place for it especially in Uganda, where we are often told to ‘guma’ or the popular chide, ‘tokikola mu bantu’. With such a suppressive culture, people that are expressive are often a breath of fresh air and will be the ones to effect useful change. Philippa gives a brief history lesson on the Liberian war. The story of Leymar Gbowee who together with Comfort Freeman, led thousands of women in peaceful protests to end the second Liberian Civil War. It began with them gathering and wearing white along the highway the president would pass in an effort to get him to see and talk to them. They needed him to sit down and start the process of peace talks with the rebels from Liberians United for Reconciliation and Democracy and Movement for Democracy in Liberia. It worked; he did. And then later, when the peace talks were proving uselessly endless, the women got on a bus and went and surrounded the room that the peace talks were happening in. They stood in a ring and anytime any of the men tried to leave they threatened to strip, which is considered a curse in Liberia. That worked too, the talks were finally finalised. These women refused to see themselves as only the oppressed. They channelled their rage, defined it and as a result there was change. Kagayi and Philippa go on to discuss the rigorous circles we run in politically as a country. The dance between Museveni and Bwesigye for example that is a never-ending loop. Museveni says something, Bwesigye responds, he is locked up in his house, he escapes, he is arrested, people protest, he is released, only for Museveni to say something again. As a performer seeking to effect change there is a need to break these cycles. To change the dance. To start to behave in a way that is not predictable. By the time Peter and Philippa launch into actual rehearsals, I feel empowered enough to start my own revolution! They then play around with various poems of theirs seeing which ones would best fit together. They study their tones, their paces, the meaning behind the words they choose to emphasise or not. Philippa recites a poem and Kagayi responds in a poem of his own. Kagayi recites Nightmares, a poem about Uganda’s unsung hero, Ben Kiwanuka. Phillippa decides to try and experiment with a hum of Uganda’s national anthem. The amount of emotion evoked after that is phenomenal. It brings up the question of patriotism; how can we be proud of our country when situations similar to what happened in the 70s still occur? How do you sing ‘Oh Uganda’ with pride and not despair? And so, The (Un)Spoken is a performance about Phillippa’s political experience as a child in the 70’s, Kagayi’s as a millennial and have the audience assess them in light of what is currently happening in Uganda. Given the current political situations in both Uganda and Kenya this performance is a necessary one. It speaks to the reality of these situations and if nothing, will inspire the audience to the hope of change. See you there, storylovers!